A visit to Compass Cay is a magical experience for cruisers. A largely untouched cay, it offers a complete cross-section of the Bahamian out-island environment: beautiful sandy beaches, mangrove creeks and flats, rugged shores, tidal creeks, hilly vistas. Many cruising sailors miss the opportunity for visiting Compass Cay because the entrance channel is not straightforward and is off-putting at a quick glance. But this hides the fact that it is very well marked and dredged. Professional captains of charter megayachts to 165' are regular visitors. The marina provides great protection in a cold front passage. 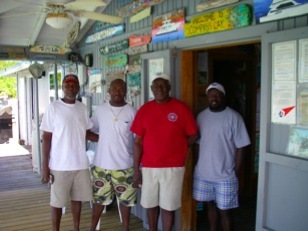 Tucker Rolle is the owner of Compass Cay and is building the marina and the cay's facilities bit by bit. A great story -- ask him. Tucker and his family extend greetings to all boaters who stop by to enjoy the beauty of Compass Cay & express thanks for their patronage and support. See Compass Cay Marina Map. The sand flats SE of the marina are dry at low tide and were once used as an airstrip. It is not clear that it is still usable. At the N tip there are the ruins of an old cistern and hand pump with a sign indicating this was the spot to washdown aircraft. 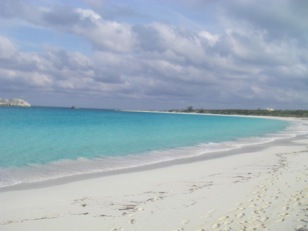 Access is by flights to near-by Staniel Cay and launch service to Compass Cay. Compass Cay Marina store offers a good selection of cold beer and a modest wine selection. Outboard runabout is available for rent from marina. Compass Cay Marina offers a book exchange. The tower at Staniel Cay is visible from the anchorage and places on shore so cell service is reasonable from lhese locations. There is a dinghy landing at the marina, just N of the long EW finger pier. Compass Cay is a private, Bahamian-owned island that relies on the patronage of guests to operate and maintain its amenities. There is a $10 / person / day landing fee to use amenities like hiking trails, beaches and swimming with the sharks. If you intend to visit the marina for drinks, groceries, clothing, RO water, etc., check to see if the landing fee will be waived before going in. The marina staff are great and are always ready to assist in an emergency. Launch service to Staniel Cay can be arranged at marina; ~$100 round trip. 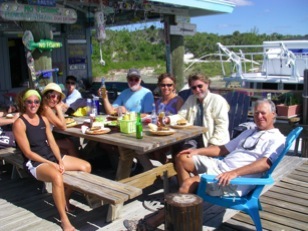 Fishing guides can be arranged by marina. Bonefish Creek, just inside the marina entrance to the N, is a nursery for these elusive and notoriously skittish fish. Over the years they have become accustomed to people at the marina and it is the only place where I have seen a large school of these fish swimming where they can be easily observed. Enquire at the marina office. There is no fuel service at Compass Cay Marina. The closest fuel sources: Staniel Cay Yacht Club and Highbourne Cay Marina; diesel, gas. Compass Cay Marina; 242-355-2137 / 2064. Ships store offers cold drinks, and a limited selection of food supplies. Tucker Rolle related that an attempt to establish a cotton plantation had once been made on Compass Cay. It failed after a few years — a fate of all the other attempts throughout the Bahamas. Cotton can still be found growing wild in some areas. 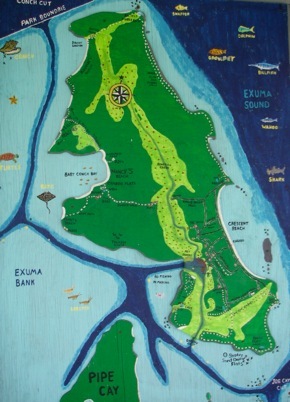 The very W segment of the island had housed a small village and residents farmed it for food. Tucker's grandparents had once lived there. There are ruins of the village hidden in the scrub. At the the NE tip of the large crescent beach on the SE area of the island, the ruins of what had once been a bungalow perched on the rock can be seen. This home had a spectacular view. It was owned by one of the women who owned the Cay, Hester. The second woman lived in a separate home. There were two jeeps on the island used by Hester and the other woman to get around on the island. Apparently they met head-on one night and Hester received a hand injury that required her to be flown off the island for treatment. She recovered and returned to the island but being of advanced age with no family or relatives to help she found island living too much and abandoned the house. Time and storms wrecked destruction and the spectacular ruins remain while the rock promontory it sits upon is also crumbling into the sea. A periodic visitor to the island has cleaned it up enough to be able to use it as an exercise facility. Compass Cay Marina; 242-355-2137 / 2064. WiFi is available for a user fee; Jan 11 rate: $10 / day or 100MB. BTC cellular data service is available from the anchorage. A celluar signal amplifier for your vessel will improve performance. The Lodge; 3 bedrooms, one bath. Lilly's Villa: 2 bedrooms, 2 baths, kitchen dining room. Crescent Beach Villa: 2 bedroom, 2 bath, kitchen dining room. Mango House: 2 bedrooms, 1 bath. Overlooking Bonefish Creek. A 5th bungalow is under construction at the N end of the crescent beach. MV Lady Francis provides service. Compass Cay Marina; 242-355-2137 / 2064; compasscay@msn.com; VHF Ch-16. 20 Slips; store; beach; hiking; WiFi. Accommodates megayachts to 165'. A new dock capable of handling vessels to >190' has been built along the N shore of the marina basin. A freestanding dock has been built just inside the marina entrance to the S. It is available for overflow when the other piers are full. 30 and 50 A service including 3-phase. New Cat genset in Jan 2011. Note: Compass Cay has a $10/ person landing fee for those who just with to visit the cay by tender. There are no mooring available. Compass Cay Marina entrance channels are rather unique in the Bahamas as they are well marked, well maintained, and dredged -- unusual. Note: channels to marina are marked but have controlling depths of < 2 m (< 6.6') at MLW. Contact marina on VHF Ch-16 for piloting service to marina. From the Banks: Proceed NE from the "Compass Cay" Explorer waypoint, following the 5 red daymarkers until the turning mark just off the W mid-coast of Compass Cay. There turn S following the guidance of the green daymarker and two daymarkers marking the narrow dredged channel. 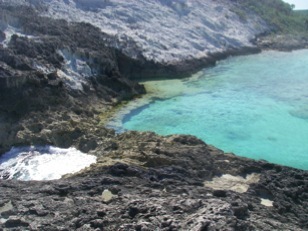 At the SW corner of the cay, favor the shore edge of the channel as you turn E. Once past this spot, there is deep water for the balance of the route. Note: Turn S around NW tip of bar. Note: Dredged channel is narrow; follow darker water and 2 R daymarkers. Note: This is the shallowest segment of the route. SV Onward with a 6.2’ draft has safely negotiated this area on a rising tide just after low. Deeper water is within a boat length of shore. From the Sound: Enter from Conch Cut channel and at the NW tip of Compass Cay, follow the narrow but deep channel S along the shore to the daymarker at the entrance to the narrow dredged channel. Then WP5 to WP13 above. Note: Navigation data and related experiences are provided for guidance and information purposes only. They are not certified as being error free. Navigation decisions are the responsibility of each captain and should be based on the appropriate navigation charts for the area and supplemented by local knowledge. Local police are located at Black Point. Mail service through Staniel Cay. Compass Cay Marina; 242-355-2137 / 2064. Menu limited to hamburgers cheeseburgers and hotdogs from the patio grill. They are good! [CC: SV Leprechaun; 2010: "the burger is an 11 on a scale of 10".] Call ahead to check availability. A new building that will host a Tiki Bar and grill / dinging area is nearing final construction (Feb 2015). Note: vessels not staying in the marina should enquire if the $10 per person landing fee will be waived for those who dingy in to have lunch. The Bahamas Cruisers Guide Cheeseburger Rating Team at Work 2011. Compass Cay Marina's Ships Store offers a good selection of clothing items and sundries. Snorkeling and fishing guides can be arranged with marina for ~$350 / trip. A number of very tame nurse sharks camp out at the dinghy dock / fish cleaning station. They are joined by large schools of bonefish and jacks. All the fish play well together and tolerate swimmers (including dogs). Of course they are hanging out of food and their response is exciting. A school of the elusive bonefish also hangs out for tidbits. This is as close as many fishermen get to these gamefish. Kayaks are available from the marina. 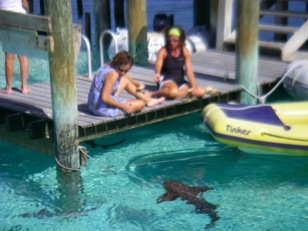 Feeding the Nurse Sharks at the Dinghy Pier. There is a beautiful sandy crescent beach on the E shore with gazebos. Rachel's Bubble Bath is a natural formation at the NE tip of Compass Cay [24º 17.0'N; 76º 31.32' W] where the waves from the Sound have almost cut through to connect up with a tidal creek that crosses the cay from the W. When the tide is up, the waves provide a frothy waterfall into the pool on the E side of the remaining barrier rock. Trash disposal is available to guests of Compass Cay Marina; separation of trash is required. RO water available at $0.50 / gal. Highborne Cay Marina broadcasts weather daily at 0730 on VHF Ch 06. "Blue Yonder" (C6AGJ), June, based on MV Emerald at Staniel Cay broadcasts a weather summery from multiple sources at 0815 on VHF Ch-12. The service is provided during the period of late November to May.